Fund managers are brimming with confidence in the future, finds the seventh edition of the BT-Morningstar Asset Allocation Survey. They were cautiously optimistic in the last survey, conducted soon after the new government was sworn in. The latest edition of the Business Today-Morningstar Asset Allocation Survey shows fund managers' faith in the new government has been reinforced. The optimism remains while the wariness has disappeared. Most of them are gung ho about the stock market. In June, Tushar Pradhan, Chief Investment Officer at HBSC Mutual Fund, had said he would not invest more than 10 per cent of his money in equities. Today, he is willing to take a 25 per cent exposure, despite the fact that the Bombay Stock Exchange's benchmark Sensex is at an all-time high of over 27,000 points and could well undergo a correction soon. "The intent of the government is clear, which gives me confidence that it will take the right steps," he says. "I am bullish on the market." Any correction too is likely to be small, fund managers feel. "Even a correction at this level will not be more than five to seven per cent," says Nirmal Jain, Chairman, India Infoline Group. "Today, the risk-return is in favour of reward." Pradhan explains why. "For the last five years, market returns have not matched earnings' growth. They have been around seven to eight per cent on a compounded basis. What we are now witnessing is the Sensex catching up." Jain has been advising his clients, mostly high net worth individuals, to invest 70 per cent of their portfolio in equities and the remaining in debt and other asset classes. Only a year ago, he was suggesting just 10 per cent investment in equities. Motilal Oswal, Chairman and Managing Director, Motilal Oswal Financial Services, was always optimistic about the stock market. He is even more so now. "I would invest all my money in the equities' market if my time horizon was three to five years," he says. "If it is shorter, say one to two years, I would invest around 40 per cent." Overall, the survey finds 73 per cent of fund managers bullish, with the rest defensive. Eighty per cent see the Sensex hovering between 28,000 and 30,000 points in the next six months. And no one expects it to fall - if at all it does - below 26,000 points. Eighty-three per cent see average earnings per share (EPS) of Sensex stocks increasing, while the rest expect it to remain constant at a growth of 15-18 per cent. No one expects it to fall. The June survey showed two thirds of fund managers expected the average price to earnings (P/E) ratio to hover between 16 and 18 times forward earnings over the next six months; this one has 55 per cent doing so. Not one fund manager believes the P/E ratio will cross 20, which means they do not think stocks are overpriced. Last time eight per cent did think it would. In the last survey, 25 per cent said they would invest more than 50 per cent of their portfolio in mid- and small-cap stocks. In a distinct shift to large caps, the figure has fallen to nine per cent in this survey. But a sizeable number, 64 per cent, are still ready to put 30 to 50 per cent of their funds in mid- and small-cap stocks, against 42 per cent last time. 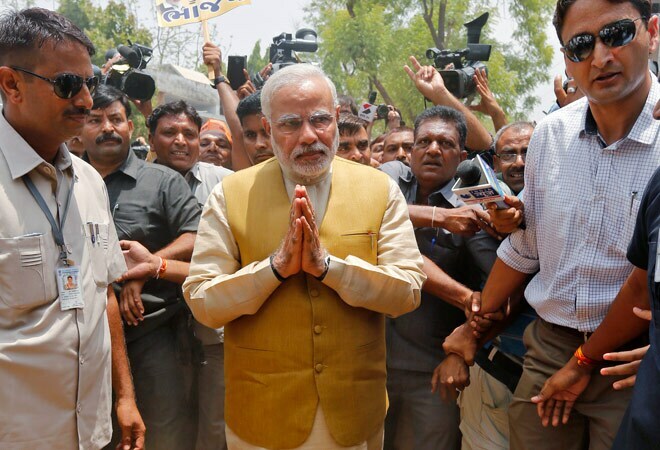 What explains the optimism under the new government? Inflation has moderated, quelling fears of interest rates being hiked. The rupee has stabilised; both current account and fiscal deficits seem to be under control. Global crude oil prices are also down. Gross domestic product (GDP) growth in the first quarter of 2014/15 was 5.7 per cent against 4.9 per cent in 2013/14. The survey shows 75 per cent expect GDP growth to remain in the 5.5 to six per cent band over the next six months, compared to only 42 per cent in the last survey. No fund manager believes growth will fall below five per cent. And 17 per cent expect it to be above six per cent, while no one did so in the last survey. "It's not just the change of government. The market has rallied because the worst seems to be over for India in terms of economic growth," says Jain of India Infoline. The overwhelming majority of respondents, 82 per cent, maintain business sentiment has improved, while the rest expect it to have stayed the same. No one thinks it has worsened. Two-thirds say they would bet on growth stocks - it was 55 per cent last time - while the remaining are still betting on value which they seem to be finding even at current Sensex levels. 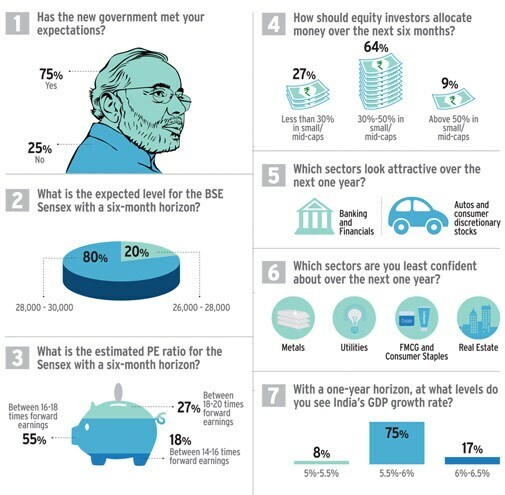 In the last survey, given the uncertain climate, 82 per cent were ready to invest in public-sector units; in this one more than half say they will not look at PSUs as a sector. As a sectoral theme, more than half say they will look at infrastructure, power and oil and gas sectors as a whole, no matter whether the companies concerned are in the public or private sector. 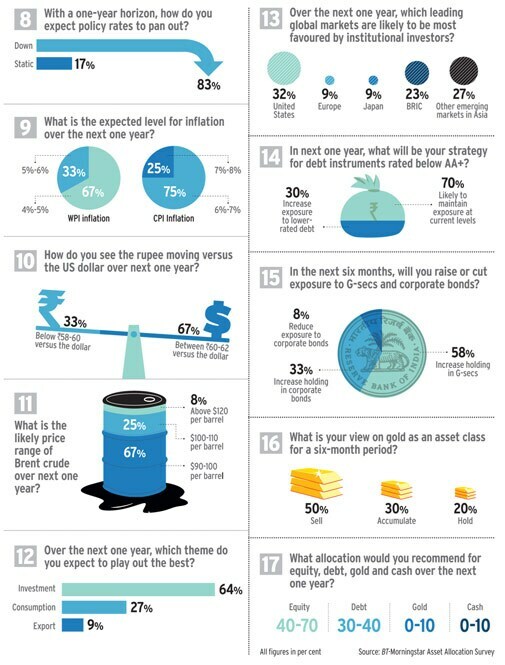 The survey also shows fund managers prefer bank, finance and discretionary consumer - including automobile - stocks, while they are wary of metals, real estate and the fast-moving consumer goods sectors as a whole. Fund managers also expect inflation to keep cooling off over the coming year. Two-thirds expect wholesale price index (WPI) inflation to stay between four and five per cent, while the remaining puts the figure at five to six per cent. Likewise, three-fourths of the respondents see consumer price index (CPI) inflation between six and seven per cent. WPI inflation dropped to a five-year low of 3.74 per cent in August from 5.19 per cent in July, while CPI inflation stood at 7.8 per cent against 7.96 per cent in July. And with inflation fears abating, 83 per cent expect the Reserve Bank of India to reduce interest rates in the near future. About half of them expect the repo rate - the rate at which the RBI borrows from banks, which is currently eight per cent - to drop to 7-7.5 per cent. The other half expects it to be between 7.5 and eight per cent. In the last survey, the sentiment was much the same, though only 18 per cent expected policy rates would drop to 7-7.5 per cent while 73 per cent expected them at 7.5 to eight per cent. This hope of interest rates dropping is reflected in 70 per cent of the fund managers surveyed saying they were increasing their exposure to lower-rated debt instruments. The strategy is that when the rates go down, debt funds will make capital gains as a fall in yields will increase bond prices. No fund manager is willing to reduce his exposure to lower-rated paper in the coming year. In the next six months 58 per cent of fund managers say they will increase their holding in government securities while 33 per cent want to increase their exposure to corporate bonds. But US interest rates remain a worry. If they rise, as they are expected to, the US will attract funds from across the globe. "The rise in US rates will see an outflow of money from all markets. India will also be impacted. That's the biggest concern," says HSBC's Pradhan. Forty per cent of fund managers feel the hike will take place in the next six to nine months, while another 40 per cent have set a time frame of nine to 12 months. The remaining see interest rates rising in three to six months. The flip side is that there is little danger of the rupee sliding - fund managers expect the rupee to stabilise at the current level of around Rs 61 against the US dollar. Two-thirds of the fund managers expect the rupee to hover between 60 and 62, while the rest believe it will strengthen to 58-60 against the dollar. Easing geopolitical tension has seen Brent oil prices fall and 67 per cent of fund managers expect them to continue hovering between $90 and $100 a barrel. Gold has lost its glitter - half of respondents say they will be selling gold while no fund manager is willing to buy gold. But the equities market is the big white hope "The best is yet to come," says Jain of India Infoline.